A complete guide to the Mopar related car and truck connections on our site. 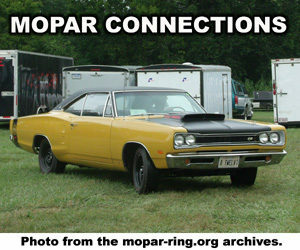 The Mopar enthusiast ring site is one of the oldest Mopar resources on the internet. Our connections feature member sites focused on individual topics. Example “If your into Dodge Chargers check out the Dodge Charger Connection” or “into trucks check out the Mopar Truck Connection” etc. Mopar Enthusiast Ring – An online community built for Mopar enthusiasts around the world. The internets oldest and largest Mopar enthusiast ring. Mopar Ring Club Connection – An online community built to promote Mopar Clubs and Organizations. Mopar Parts & Services Connection – An online mopar community promoting business sites that offer parts or services for mopar enthusiasts. A great resource on what is available for our Mopar vehicles. Chrysler Connection – An online Chrysler community devoted to Chrysler vehicle owners and enthusiasts. Built to promote personal web sites and pages providing information about Chrysler cars. Dodge Connection – An online community dedicated to Dodge car owners and enthusiasts worldwide. A great resource for locating personal Dodge car related web sites on the internet. Dodge Challenger Connection – An online community dedicated to Dodge Challenger owners and enthusiasts worldwide. A great resource for locating personal Dodge Challenger related web sites on the internet. Dodge Charger Connection – An online community dedicated to Dodge Charger owners and enthusiasts worldwide. A great resource for locating personal Dodge Charger related web sites on the internet. Dodge Dart Connection – An online community dedicated to Dodge Dart owners and enthusiasts worldwide. A great resource for locating personal Dodge Dart related web sites on the internet. Dodge Dakota Connection – An online Dodge Truck community devoted to Dodge Dakota Truck owners and enthusiasts. Built to promote personal web sites and pages providing information about the Dakota Truck. Dodge Dakota R/T Connection – An online Dodge Truck community devoted to Dodge Dakota R/T owners and enthusiasts. Built to promote personal web sites and pages providing information about the “Limited Production” Dakota R/T Truck. Mopar Truck Connection – An online community dedicated to Dodge and RAM Truck owners and enthusiasts worldwide. A great resource for locating personal Mopar Truck related web sites on the internet. Plymouth Connection – An online community dedicated to Plymouth vehicle owners and enthusiasts worldwide. A great resource for locating personal Plymouth related web sites on the internet.